Though most of my time was spent traipsing across stunning, boggy and rocky landscapes of the Western Highlands and Inner Hebrides, which gave me lots of time for contemplation before Rosh Hashana, I did carve out a bit of time for Jewish exploration in Glasgow. 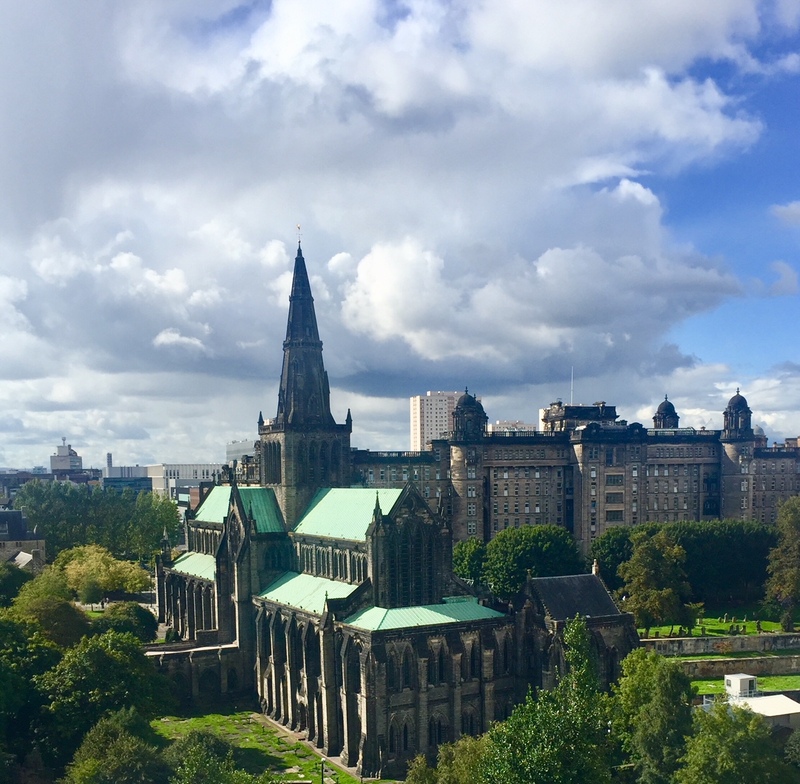 The city is home to the majority of Scottish Jews (currently about 4,000 people). 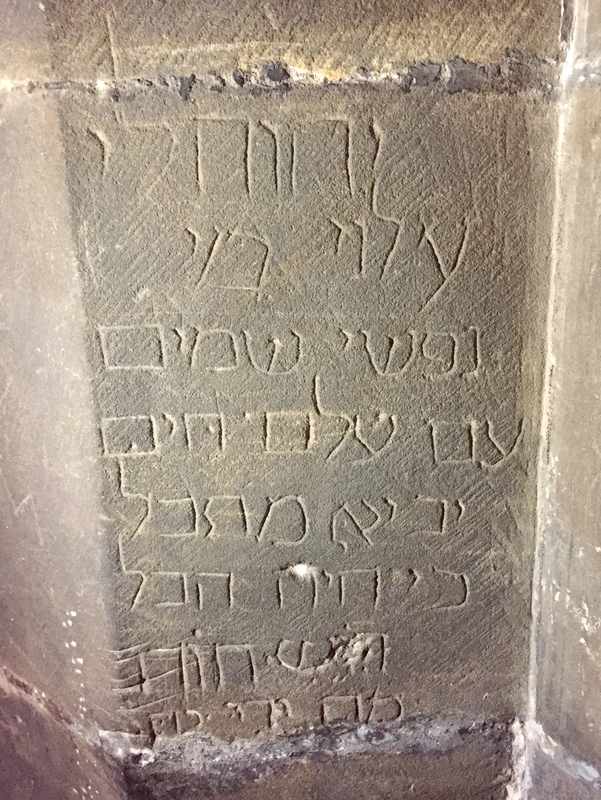 While touring the 12th century Glasgow Cathedral, I saw Hebrew writing etched into a pillar (as an aside, the room was filled with an ill-placed bizarre temporary exhibit of iconic global sites made with Legos by a 50+ year old man). Upon inquiring at the information desk about the Hebrew, I was told by two cheery volunteers dressed in matching royal blue robes-who firmly corrected each other and engaged in ironic and witty disagreements like an old married couple (but shuddered when asked if this was true)–that it was done anywhere from “a very long time ago” to maybe the 1880s and perhaps done by “some drunk Jewish guy one night”. Though the answers to my questions still left me confused, the hilarity of the guides made the entire visit even more worthwhile. 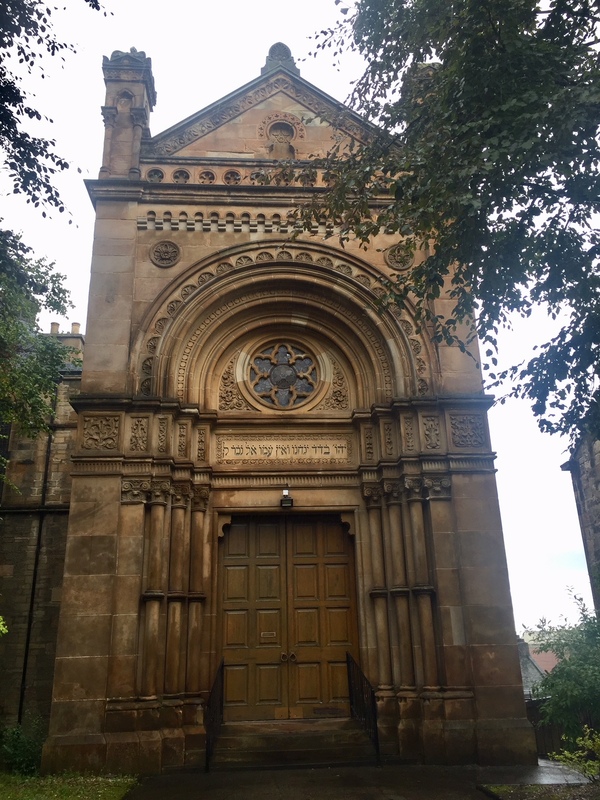 After visiting the Cathedral, a walk across central Glasgow took me to the historic Garnethill synagogue, built in the 1880s. Unfortunately, it was closed when I visited but the stunning, elegant building was nestled amongst old trees and bushes. A Scottish woman I know who was married at the synagogue explained that as the Jewish population of Glasgow has shrunk (from about 10,000), congregations have combined and/or closed. This synagogue, though, is still fully in use and also houses the Scottish Jewish Archives. This day in Glasgow was also marked by delicious meals at two vegan restaurants. Dinner was at 78, a cozy, inviting restaurant with large wooden tables, low ceilings, a fireplace and patrons from all walks of life. After a chilly day mixed with intermittent downpours, a bowl of their warm pea and mint soup was especially memorable. I have now learned that this is a common British dish but not something I had eaten before. It was soothing, creamy and perfect for the weather. It was a delicate, creamy soup in a shade of yellow/green that was reminiscent of some of the boggy fields I had hiked through during my trip. The mint was very subtle with the peas being the dominant flavor. It also made me think that it would be an excellent dish to break the Yom Kippur fast. I do not do well at break-fasts that are laden with heavy sugar, oily foods and breads. My body cannot digest them after fasting all day and lighter foods feel best. 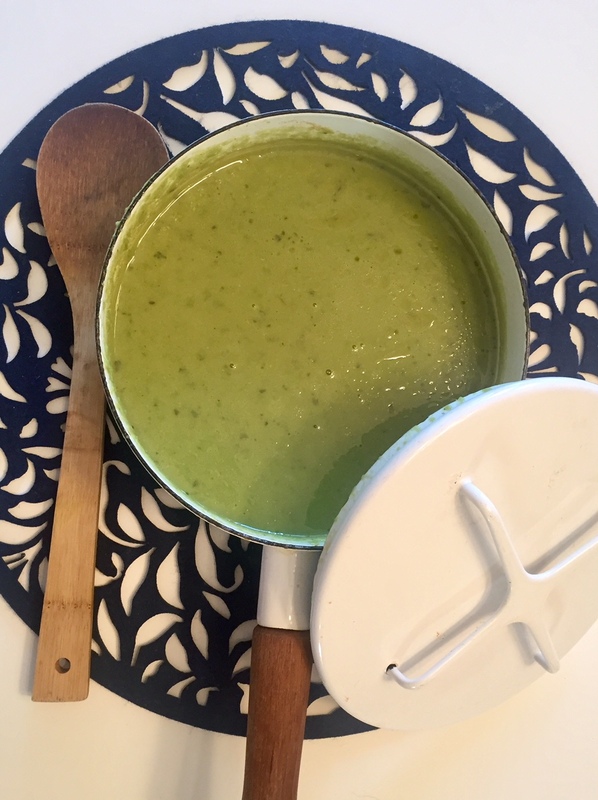 This soup is easily digestible and gives your body both much needed liquid and nutrients after a day of fasting. And a synagogue I attend has an abundance of mint growing in its herb garden, making it an even more enticing dish with freshly picked mint. 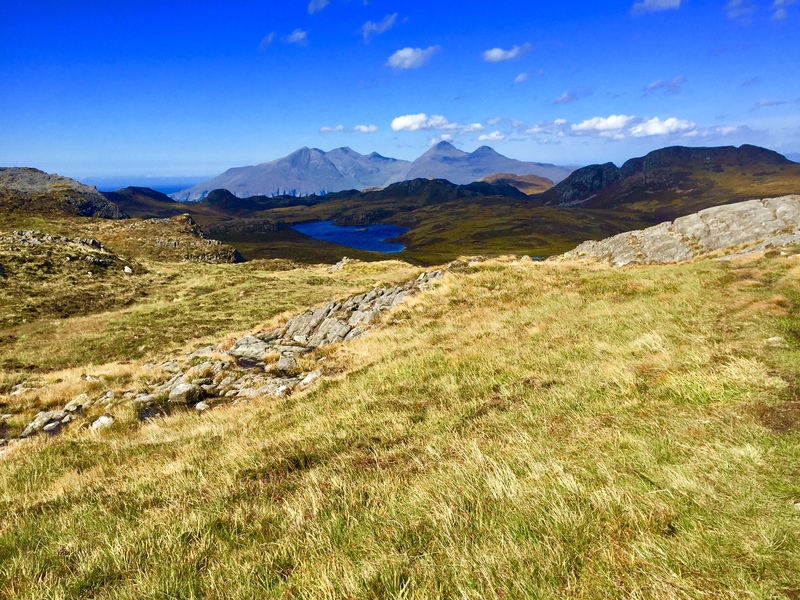 Wind-swept, boggy hike on the Isle of Eigg. The soup is a similar grassy color. 1. Bring a small pot of water to a boil. Add the potato and parboil it. Remove and chop into pieces. 2. In a medium-sized pot, on medium heat, add the olive oil and heat until warm. Add the onions, garlic, mint and potato. Mix well and cook on low heat for about five minutes. 3. Fold in the peas. 4. Add the liquids and mix well. Bring to a boil and then reduce to a simmer for 5-10 minutes. 6. Remove from heat and add to a blender to puree. 7. Serve warm with a drizzle of olive oil. PS: For my other Yom Kippur recipes, click here. 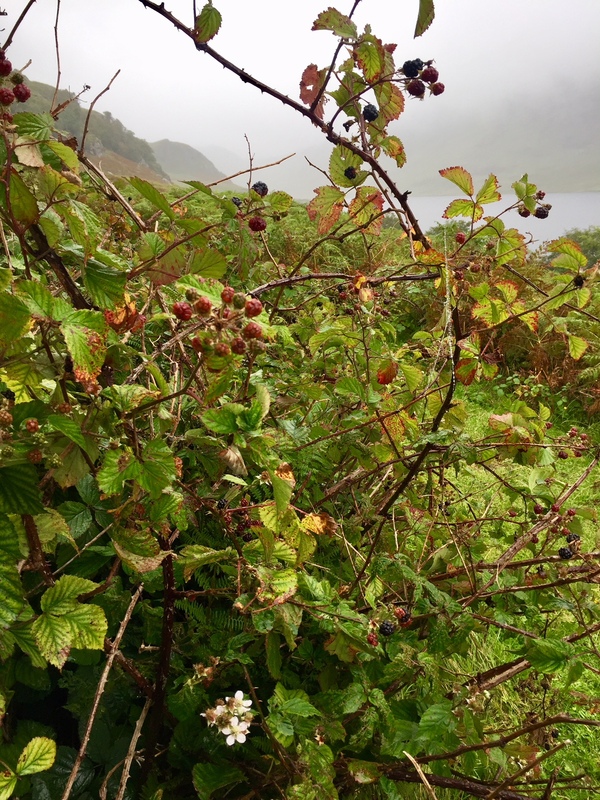 This entry was posted in Holiday, Soup, Tishrei, Travel, vegetable, Yom Kippur and tagged break fast, breakfast, cooking, food, hiking, kosher, pea and mint soup, Scotland, soup, vegan, Yom Kippur by Sarah Newman. Bookmark the permalink. Enjoyed reading your post, Sarah. My grandpa was from Glasgow and its Jewish community, so interesting to read a bit about it. I’m afraid I’m of the ilk that goes a bit bananas on the food stakes post-Yom Kippur! But something lighter I’m sure is much more healthy.. So glad you enjoyed reading the post. And, very interesting about your grandfather–it’s such a small community and must be a treasure of interesting stories. Hope you had a good YK fast & breakfast. Thanks Sarah! In fact, I’m in the midst of writing a blog-post about my family migrating from East Europe to Glasgow at the turn of the 19th Century, and about a particular story about Grandpa, so it’s very much in my mind at the moment!..